We’ve lived at the farmhouse for over nine months now and in that time I’ve moved things around in our kitchen at least three times. On the outside it still looks like it did here shortly after we moved in, but I keep reorganizing all the cabinets and drawers trying to find the right location for everything. Some may call it nesting, but I think it’s just about finding the best way to arrange storage based on how you use the space! 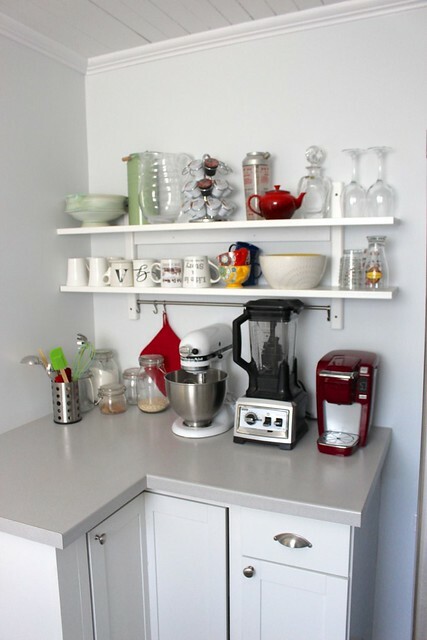 When you have no upper cabinets in your kitchen, just open shelving, so you have to get creative with how you store everything. 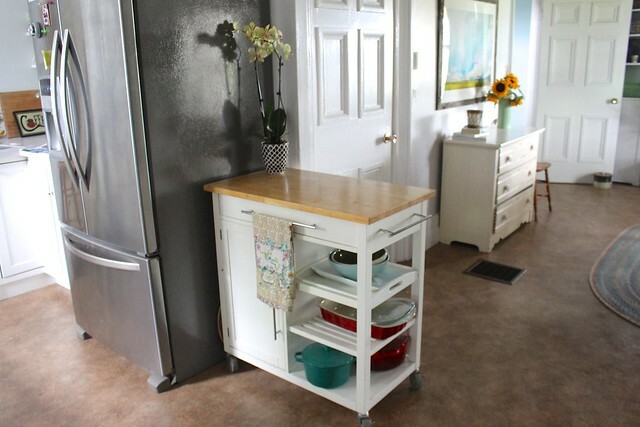 I’ve taken advantage of the two kitchen carts I had from the apartment, and used those for extra storage, along with the dresser and hutch we have in the dining room (for pieces that we don’t use that often). In the corner by the fridge, I have it set up as a our baking and coffee station. I rearrange things on the shelves every couple of months, but otherwise it still looks the same. This was once our junk drawer, but I’ve since cleared it out and made it into storage for all my smaller baking tools. 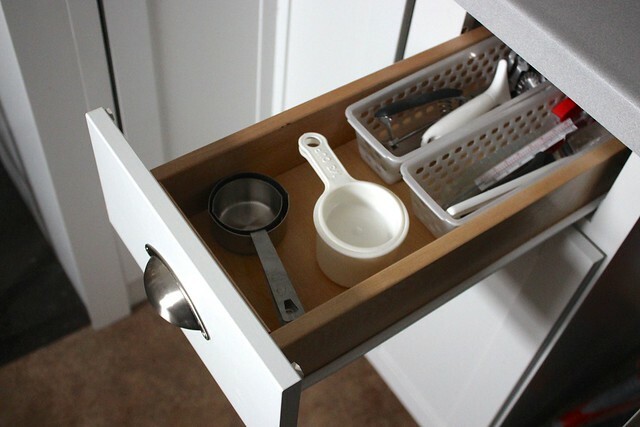 It’s so convenient to open the drawer and grab a measuring cup when you need it. No digging around in a drawer of odds and ends. One of the biggest questions about the kitchen I get asked when friends come over is “where are your plates”? The shelves are not deep enough to hold our plates, but we have a drawer conveniently located between the stove and dishwasher that we stack them in. 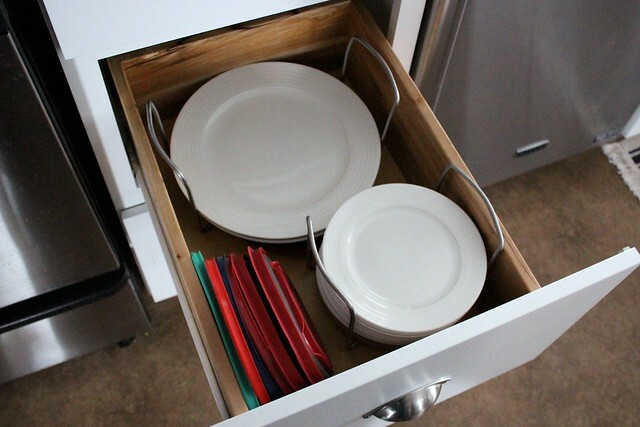 I found these great plate holders from IKEA that keep everything corralled in the drawer. In the spare space, I store larger lids for our glass and ceramic food storage containers, which go in the drawer below. 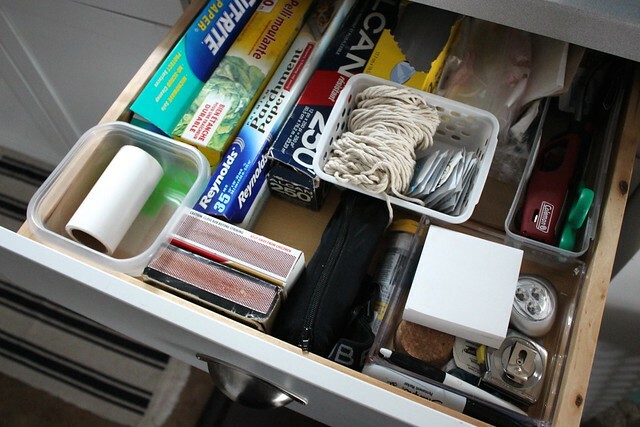 Even our messiest drawer has been organized with some dividers. This is where we keep food wrap, twine, pens, barbecue lighters, matches, etc. I even keep a tape measure here and a small phillips head screwdriver for quick projects. 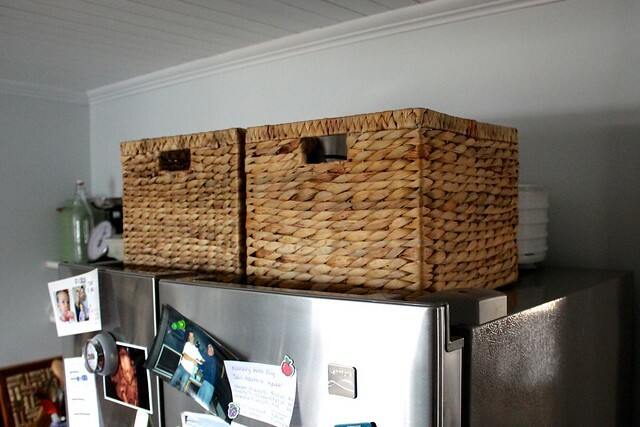 I recently grabbed these woven baskets for the top of the fridge as well. I use them to store lunch bags, bottles and thermos in one and spare parts for our blender/food processor in the other. They also keep some of our larger appliances like the dehydrator hidden behind them. 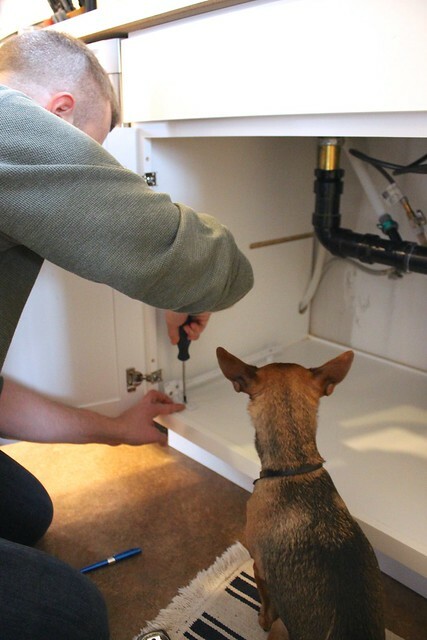 This latest kitchen reorganization came about when I decided to tackle the mess of cleaning supplies under our kitchen sink. I know we’ve got a long time until the baby will be getting into things like this, but I decided to move all the cleaning supplies to somewhere safer now while I had the gumption to do so. 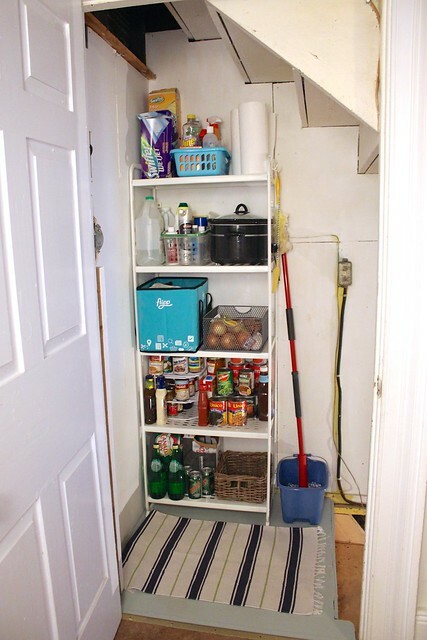 When we set up the pantry in our basement stairwell last month, I used the top two shelves to store almost all of our cleaning supplies. 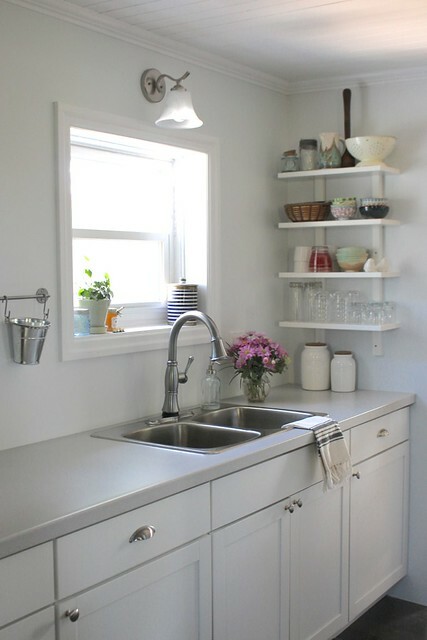 It’s only a few steps away from the kitchen sink, so it doesn’t take much more to go grab them, and I like knowing they’re tucked away from any curious little ones in the future. The end result is so much nicer! 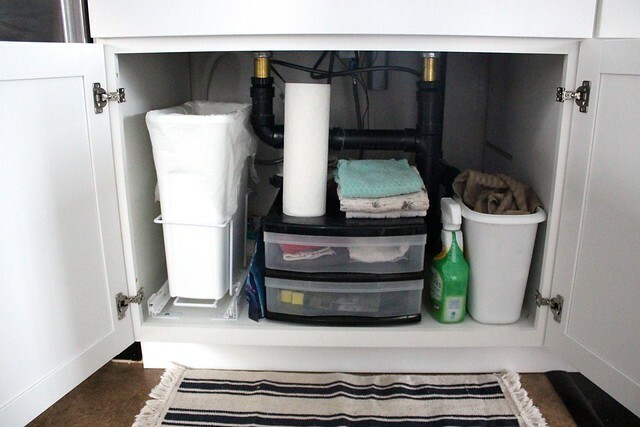 Now we have the garbage on the left, all our kitchen rags, sponges and brushes stored in some plastic drawers in the middle and a small bin on the right to put the dirty rags for the laundry. 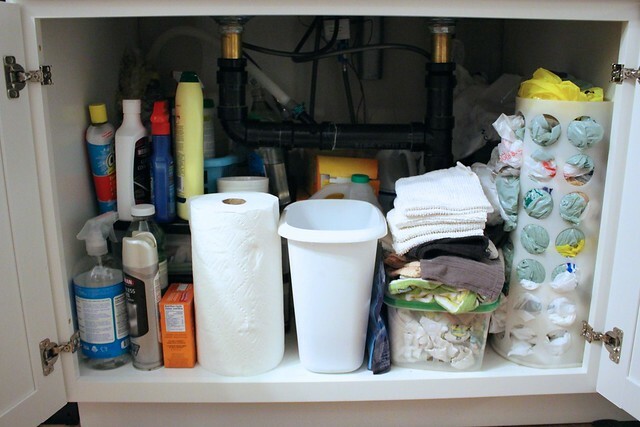 I still kept our counter spray and paper towel under the sink for quick clean ups, but otherwise everything else is in the pantry. 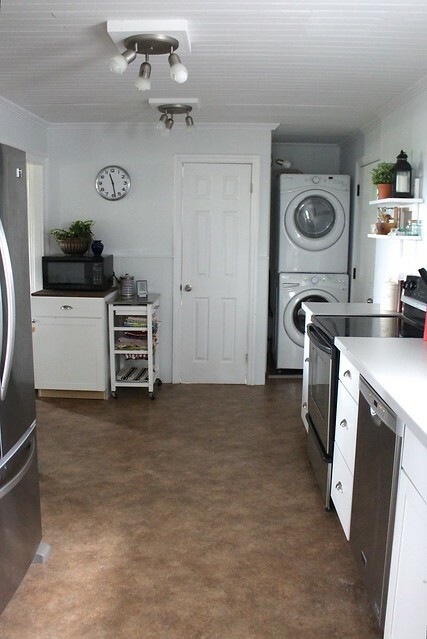 Someday we hope to switch the kitchen and dining room, to make it into an even bigger kitchen, but for now I love our little farmhouse kitchen. I’m sure this isn’t the last time that I rearrange everything, but for now it seems to be working for us.